Bushfires are a part of life in Australia in the hotter parts of the year, mostly summer. These result in loss of forested areas, including animal habitat and animals, reptiles and birds killed along with humans. People who choose to build in high bush fire danger areas, particularly if it is on the top of a hill (where we get the best view) need to take all the precautions they can, especially since the fires like Marysville and King Lake, where people who believed that they were perfectly safe, were killed. Some had lived all their lives, safely, on the mountain at King Lake. While areas such as the Blue Mountains have fires almost every year in vast areas of the mountains, we in Queensland endeavour to “fire proof” large areas of the state by “back burning” and installing firebreaks. We also maintain a highly active volunteer Rural Fire Brigade in most country areas. A Queensland Brisbane north company called “Safety of the World” has been working in Australia for the past 2 years to develop a fire shelter which is absolutely safe in any fire storm, thus ensuring no loss of life. It can also double as a storm or cyclone shelter, if needed. 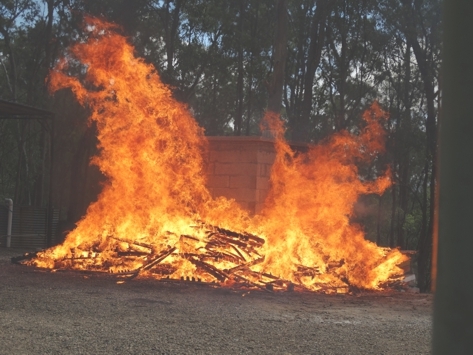 Safety of the World conducted the first recorded Australian full fire shelter test burn at high temperature (1000oC plus) with the assistance of the Samsonvale Rural Fire Brigade (SRFB) on Saturday 17th October 2015 at the property of Paul and Sue Crompton. A large number of pine pallets were arranged around the fire shelter, including the doorway, and when lit, the fire rapidly engulfed the building. A safe fire perimeter was set in place around the shelter by the SRFB for observers and photographers. It certainly was a successful demonstration. 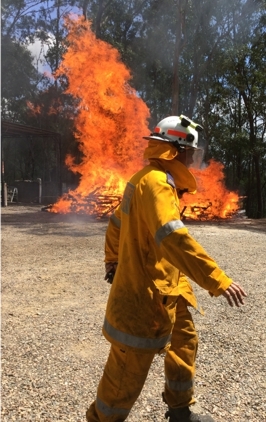 The test burn was attended by members of Samsonvale Rural Fire Brigade. The fire shelter is constructed of volcanic rock imported from northern Europe where the product has been known and used for more than 25 years, and this special “block” is made from cooled lava which has solidified. 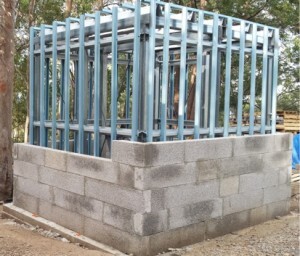 The block has been made into a building block stronger than the normal Australian building block. 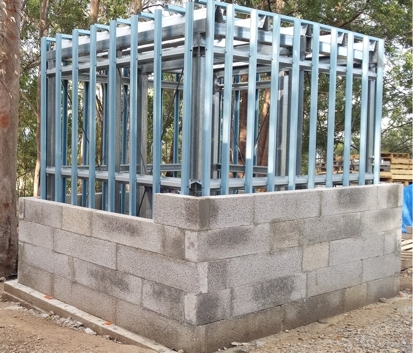 It has a steel frame underneath the fire proof block cladding and a door constructed of volcanic rock. Overseas testing of the fireproof cladding has been completed to 1050oC for a duration of 40 minutes. An average Australian fire has been estimated to reach temperatures between 250 and 450oC. Firestorms can reach over 1000oC for approximately 5 minutes and travel between speeds of 120 to 140 km/h. Safety of the World constructed the fire shelter at Kobble Creek and independent “on site” testing was undertaken by the Queensland University of Technology during the demonstration. The exterior temperature recorded exceeded the target of 800°-1000oC for 20 minutes (at least 1000°C for 5 minutes plus) and multiple sensors set up internally on the ceiling, walls and door recorded about 25oC to 30oC at the ceiling indicating a successful test. Readings were also conducted by a private consultant to monitor the air quality inside the shelter, but a Safety of the World shelter will include a compressed air bottle and masks, because you never know what’s in the air surroundings. Early data is encouraging and further research will be undertaken. The display was most impressive and the fire shelter will provide another layer of safety precautions people can use if they decide to live in a bushland area. It is certainly an option to be considered in many parts of Australia. The cost of building a shelter remains to be set, but believe a building kit is approximately $25,000. Safety of the World do have some promotional shelter kits (15) going out for a discounted price of $18,000. Just a reminder that the fire season is here and make sure your fire plan and escape route is set and ready to operate. 2015 Brisbane Region QFES Annual Commemorative Remembrance Service.